We sometimes hear or read that in this day and age, business cards are a thing of the past. Well, to be honest, I was one of those people who thought so. I mean, there are so many ways to get in touch and my preferred choice is obviously via email; and the business card just seemed, in a word — obsolete. I had no idea how wrong I was. My life was turned upside down when the people from MOO, a printing company from the UK, contacted me and basically said, “Hey, try MOO.” So I did. Today, we’ll be taking a quick look at what MOO is all about and we placed several test orders with them to find out how great their print quality is. We’ll also be giving away 5 packs of 100 MiniCards after the review so stay tuned! MOO prints a wide variety of items from business cards to MiniCards, postcards, greeting cards, stickers and labels. We don’t really have the resources to look into every product that they offer so we’ll just look at one — a very exciting product called MiniCards. MiniCards aren’t your conventional business card and that’s what sets it apart. They’re half the size yet packs a punch, if designed properly. They’re made out of 2.75″ x 1.10″ thick 350gsm stock paper with a matte finish. You can print on both sides of the card and even have an individual design on every card with Printfinity (more on that later!). A pack of 100 MiniCards only goes for $19.99 plus shipping and the more you buy, the more you save. Let’s actually see what the design process is like. To start, create a MOO account or sign in with Facebook in order to save your designs and pick up where you left of. MOO pampers you with a variety of options to start with. Say it’s your first time designing a business card — no problem, MOO has a huge library of ready-made designs to be deployed. Just browse through the library, pick the designs you like and work off them. If you’re feeling courageous, start from scratch and upload your own designs. The process starts off by getting you to design the back of the cards. As previously mentioned, you can have up to 100 designs in the same pack with Printfinity — this is the option that sets MOO apart. By allowing you to customise your MiniCards, you can make each card unique and exciting. There’s a lot of options to be explored here but sadly, we have to push on with our review. After your photos or designs are uploaded, they’ll be presented to you in a neat interface. Here’s where you’ll have the chance to adjust their orientation, zoom in or out if necessary and pan images about. If you’re working with several designs, MOO will automatically calculate the number of cards you’ll receive per design. They’ll be evenly distributed so you can’t have 90 cards in one design and 10 cards in another. MOO offers a “photo enhancement” option that is recommended for photographs. Basically, it tweaks the image and primes it for printing. The difference isn’t that obvious to me so if it helps out with printing, I’m on board. Next up, designing the front of the card. I’m sure this is a familiar interface: font selection, justification, background colour, etc. Sure, MOO provides several fonts to choose from and even allows you to add an image to the front of the MiniCard but if you look closely, you also have the option to upload a complete design. This is where things get interesting — you have the opportunity to think outside of the box and bypass the web interface, use Photoshop (or any preferred image editor) to design the front of your card and upload it to MOO. So I downloaded the design template, launched Photoshop and started brainstorming. About two weeks later, I received a delivery from the UK — my MOO MiniCards have arrived; much earlier than I’d anticipated. The pack of 100 MiniCards came in a very simplistic box, complete with separator cards. Immediately, I was impressed by the print quality. The cards didn’t look very far off from the original photos. Most of my photos have gone through post-processing but still managed to print fine. I’m generally quite pleased with the images I picked, particularly this one with the ceiling of the Sistine Chapel. It’s probably not the best out-of-the-box thinking but this is what I came up with for the front of my MiniCard. The pack of MiniCards I received were quite nicely cut despite the size. Overall impression? I’m quite chuffed. The design process is easy to use. Their servers are fast so uploading designs is a breeze. You don’t have to limit yourself to the plain, old text business card. Instead of images, you can also use text for the back of your cards. And with Printfinity, you don’t have to commit to just one design. Here’s what James Bruce did with his pack of MiniCards. James is from the UK so he was the first to receive them. According to James, the design process was very intuitive and he was impressed with the amount of pre-made designs, as well as Printfinity. He also found the print quality to be pretty good. This card in particular, was a difficult one to print but it turned out okay (with a few dodgy bits). And now, it’s Yaara Lancet’s turn! Yaara designed the front side of her MiniCards as well and it looks great. Yaara obviously found the whole design process to be really awesome because she printed 50 designs! Take a look. Yaara also noted that she was happy with the cutting — it was pretty accurate. Also, Yaara’s cards reached her in 8 business days — a week earlier than stated. Three different tests from three different countries — Yaara in Israel, James in the UK and yours truly in Australia — all with the same conclusion: we’re extremely happy with our MiniCards! 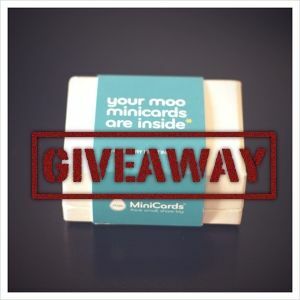 We’re giving away 5 boxes of 100 MiniCards to MakeUseOf readers this week. Here’s how you can win one. This giveaway begins now and ends Wednesday, February 15th. The winners will be selected at random and informed via email. Explore more about: Business Card, MakeUseOf Giveaway, Printables, Printing. i am very excited about this!! i have needed to buy some kind of card for my online fabric business as well as my charity and the website that i use to promote my book online. i have been dragging my feet because i just am not that creative but this idea really got my attention. i hope i win the prize:) i live in greece so i am pretty close to the UK. I'm in the process of finalising a business plan, so "winning" this would put the icing on cake! I used Moo for my wedding - tviira cards during the reception as well as another set for the url to the photo gallery on the way home. Needless to say I love them. One project I've been itching to try for a while is to have millions of different "happy notes," where you have stickers or small notes in unexpected places in the city that say things like, smile, or you're beautiful, etc etc. I did it in a large poster format but would love to make it more subtle. I called it my happiness project last time. I took advantage of a free offer about 2 weeks ago promoting the MOO Facebook cards - they pull info from your facebook photos, etc. I am a graphic designer and had previously tried VistaPrint and was APPALLED at the horrible quality of the VistaPrint cards - they were cheap looking, the font was way too small to even read (even though the onscreen preview showed a different size) and worst of all they were WAY off center. I decided to try MOO cards to see how they compared - I was EXTREMELY pleased with the cards from MOO - the design process was simple, the company kept me informed of every step and the cards I rec'v were better quality than I expected. I would HIGHLY recommend MOO Cards... as for the box of VistaPrint cards - they went to the dumpster - was too embarrassed to even give a single one out. I will never do business with VistaPrint again.